The Management Body of Kotychi and Strofylia Wetlands is a nonprofit private legal Entity, supervised by the Ministry of Environment, Energy and Climate Change. It was founded in 2002 by National Law and it is governed by a Board of 11 members that represent central Government, all levels of local Government, Environmental Organisations, local stakeholders and the scientific community. The Administrative office of the Body and the Information Centre are located in the village of Lappa, in the Prefecture of Achaia. The Management Body is responsible for the conservation and management of biodiversity, sustainable development within the area, raising awareness concerning the ecological importance of the area, environmental education and reinforcement of supervision within the PA in collaboration with other relevant services such as the Forestry and Fire Departments. Due to its high biodiversity and rare aesthetic value, a number of protection designations have been assigned to the area. Part of it has been recognized as a Wetland of International Importance in 1975, when it was included in the 10 Wetlands of Greece protected under the Ramsar Convention. Later, parts of the area were recognized as Special Protection Areas (SPAs) for Birds, in accordance with the Directive 2009/147/EE, as well as Sites of Community Importance (SCIs) in accordance with the Directive 92/43/EEC, which led to the establishment of the European NATURA 2000 Network of protected areas. The Management Body of Kotychi and Strofylia Wetlands was founded in 2002, and its task is the conservation, management and sustainable development within the area. In 2009 the“Terrestrial, aquatic and marine areas of Kotychi Lagoon, Strofylia Forest and their adjacent regions” received the designation of “National Park of Kotychi and Strofylia Wetlands, under National Law. The Protected Area extends over an area of 14300ha, with a shore line of approximately 22 km, spanning across both Achaia and Ileia prefectures. The area presents a mosaic of different habitats which include wetlands and seasonally flooded expanses, the Umbrella pine forest, sand dunes and calcareous hills with remnant shrub vegetation. The system of wetlands comprises 4 water bodies along with their adjoining floodplains. Of the permanent wetlands of the area, Kotychi is the largest lagoon of the Peloponnese (750 ha). 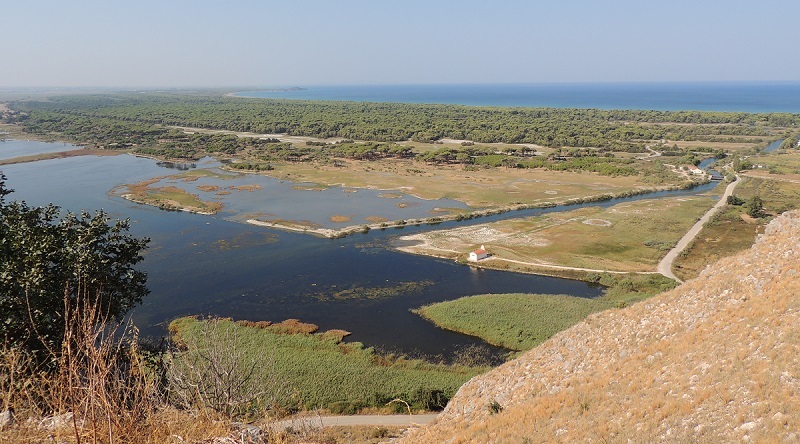 It is a typical Mediterranean lagoon separated by only a narrow strand of land from the Ionian Sea, and it constitutes an ideal biotope for a significant number of bird species during migration, wintering and breeding. At the northern border of the National Park, lies the lagoon of Araxos which shows the highest salinity of all the water bodies in the area. To its south, at the foot of the Black Mountains hills, lies Prokopos lagoon which is characterized by frequent alternations in depth, thus forming a variety of habitat conditions. Traditional fishing, by means of retractable nets, is practiced in all three lagoons by local fishermen’s associations. Large expanses of floodplains surround the wetlands. During winter, they collect the seasonal water and act as feeding ground for waterfowl, whereas during summer, when they dry off, and serve as breeding ground for rare species such as the Collared pratincole (Glareola pratincola) and the Little Tern (Sterna albifrons) and they present varied vegetation including halophytic species such as Salicornia sp. South of Prokopos lagoon one encounters the marshes of Lamia, an extended shallow marsh seasonally connected to Prokopos lagoon, which is frequented by the bittern (Botaurus stellaris). The major attraction of the National Park is the famous Umbrella pine (Pinus pinea) forest of Strofylia, the most extensive Umbrella pine forest in all of Greece and one of the largest in Europe. The total area of this coastal forest is approximately 2,200 ha with an average width of 1,250 meters. The forest, which depends directly on the presence of water, is located in the northwestern region of the area between the wetlands and the sea. The Umbrella pine tree has a characteristic umbrella shaped crown and is known for its edible pine nut. However, the greater part of the forest is dominated by the Allepo pine (Pinus halepensis), and also includes a small residual cluster of Vallonea oak (Quercus macrolepis), a remnant of the ancient oak forests that covered the area.